Patients and visitors are invited to visit our Gift Shop. It is located on the 1st floor of the health center near the main lobby. The shop offers an assortment of gifts appropriate for adults and children, flowers, greeting cards, and other unique items. 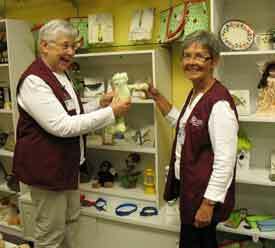 The Gift Shop is operated by the volunteers of the FCHC Auxiliary. The Gift Shop is open Monday through Friday from 9:00 a.m. to 7:30 p.m. and Saturday and Sunday from 1:00 p.m. to 7:30 p.m. All Gift Shop proceeds directly support the mission of Fulton County Health Center. In addition, the FCHC Gift Shop has partnered with local florist, “Anything Grows” in Wauseon to provide a means to order flowers on-line for a loved one while on our campus. Orders may be placed 24 hours a day through the web link below. Orders placed Monday thru Friday will be processed and filled within 24 hours of receipt. Orders received after 6:00 p.m. on Fridays may face delayed processing until the following Monday at 10:00 a.m. If the intended gift recipient (patient) has been released from Fulton County Health Center, a representative from “Anything Grows” will notify you to discuss other delivery options. If you have any questions about ordering flowers on-line, you may contact “Anything Grows” at 419-335- 5092 or toll free at 1-800-297-8030 during normal business hours, Monday – Friday 8:00AM-7:00PM or Saturday 9:00AM – 4:00PM. When ordering thru this website: Please fill in the “How did you hear about us?” field with FCHC on line. With your order a donation will be made to the Fulton County Health Center Auxiliary.